Okay, so first let me just say this post makes me SO VERY HAPPY. 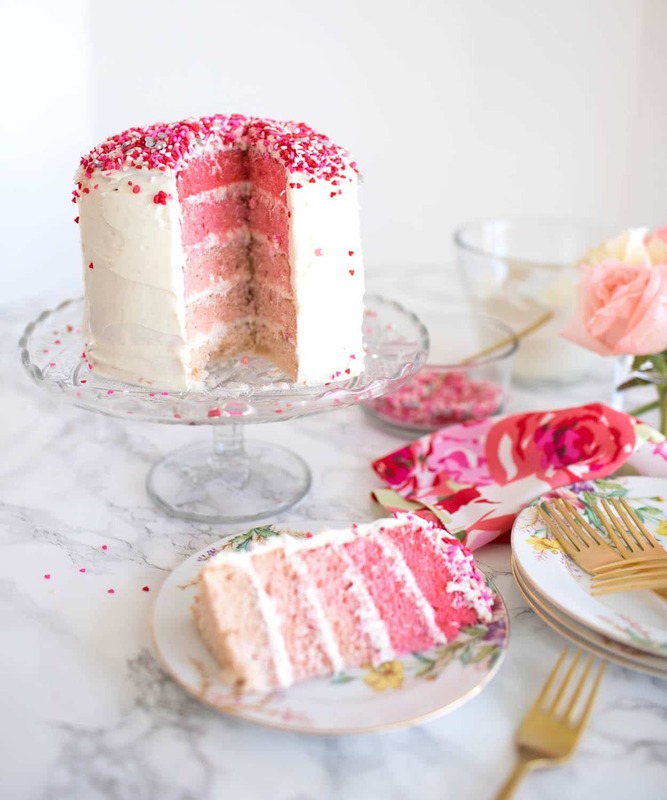 I do not know what it is about ombré cakes, but I just love them so much. 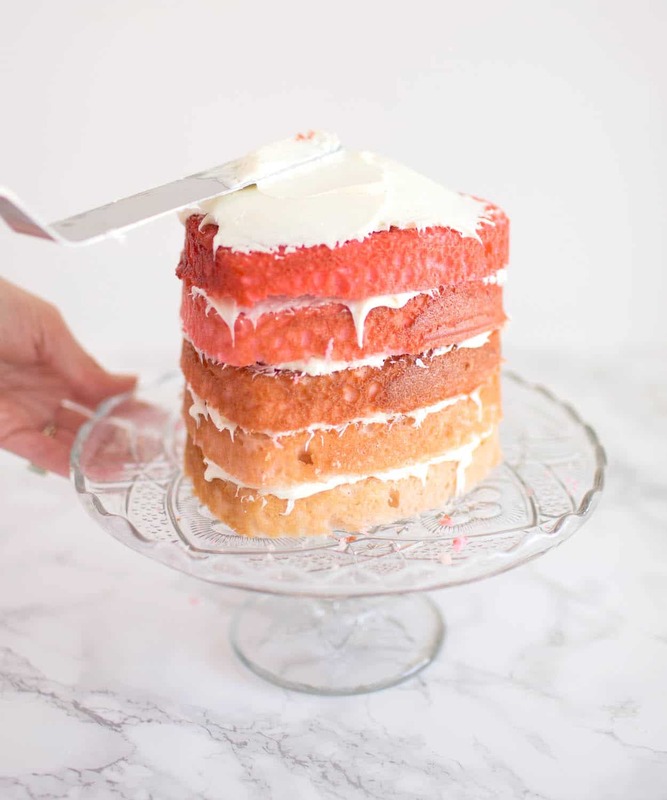 I made one a few years ago for my sister-in-law and that blog post still stands as one of our most read blog posts in the history of posts, so it’s not just me who loves a good ombré cake! 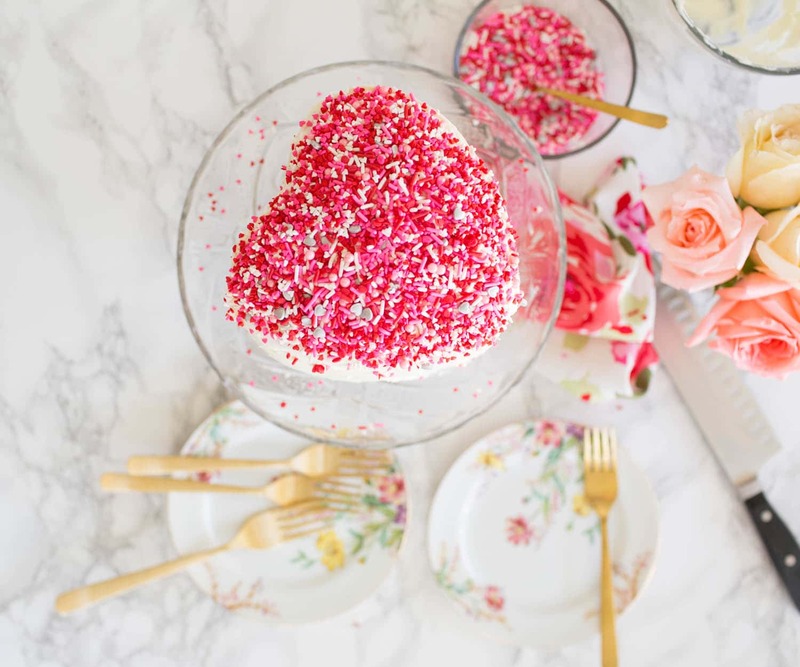 This year I decided to really take it up a few notches and make a pink heart shaped cake with sprinkles and sparklers, just in time for Valentine’s Day! Now, before you say, “Ashley, this is a little too advanced for me…” no it isn’t!! Let’s get one thing straight, this cake was made from boxed cake mix and a tub of store bought icing, so calm down… you too can do this! Also, I’m going to walk you through it, so don’t you worry! 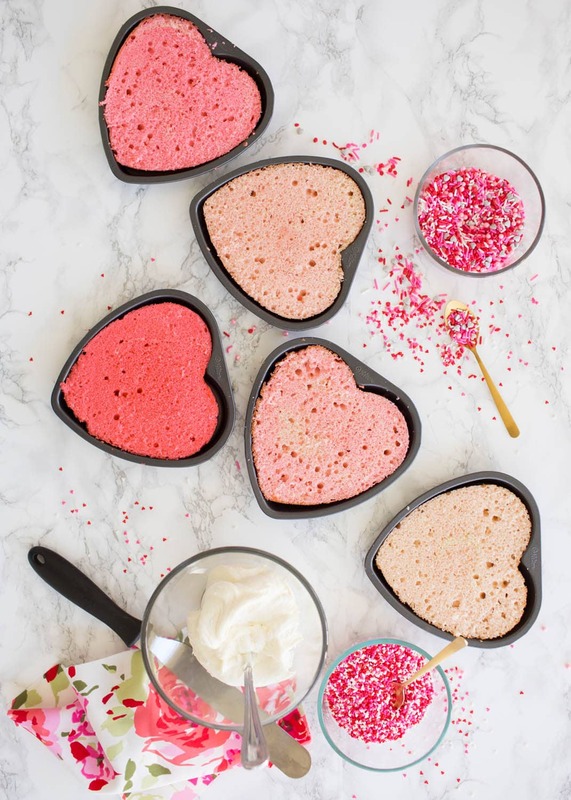 Heart Shaped Cake Tins – These are a game changer! 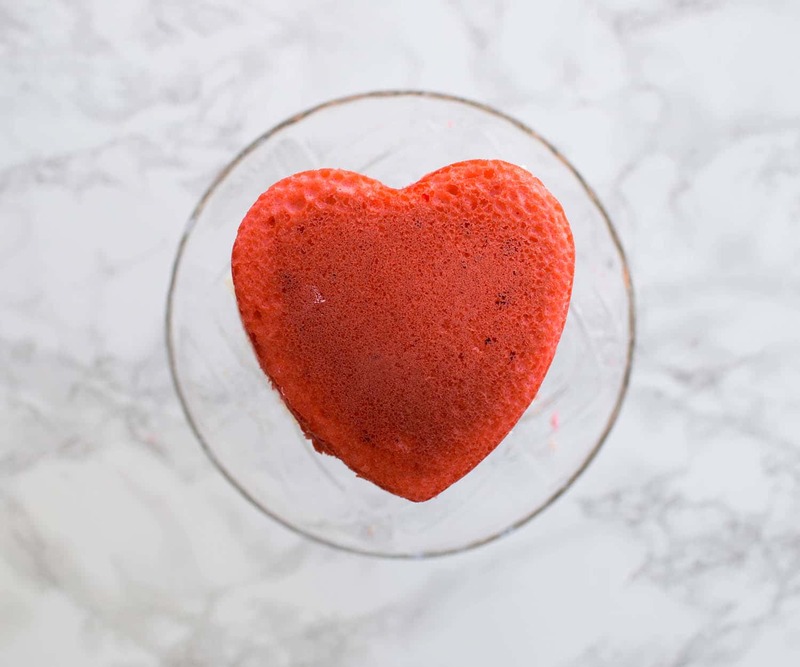 Gel food coloring – You’ll definitely want this kind! 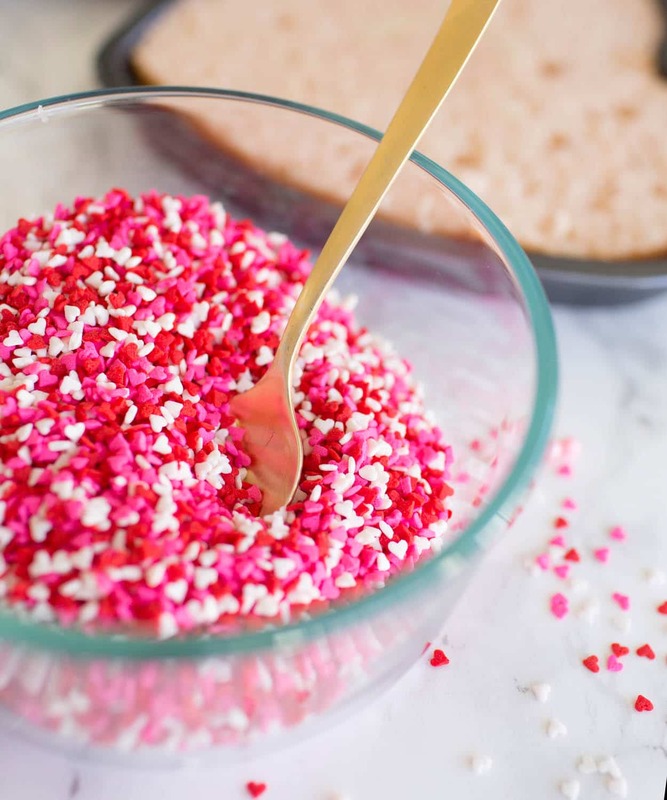 Sprinkles – I used these! I have done this a few times and have made a mistake on the ombré situation more than once, but this time I figured it out. Go ahead and dump all of the cake mix ingredients into a bowl, and get it all mixed up and ready to go. Next to the bowl, line up your cake pans and have them ready to be filled! Now, dip a toothpick into the gel food coloring, and then dip the toothpick into the cake mix. It doesn’t seem like it will do much, but that gel food coloring is serious! Trust me, start off with a tiny bit. 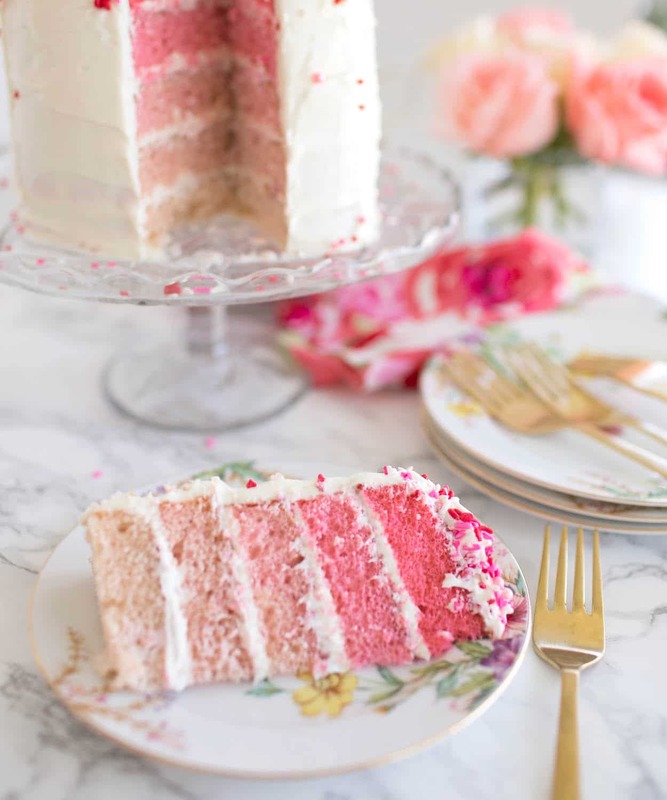 Once you have the color to a light pink, fill up your first cake pan. 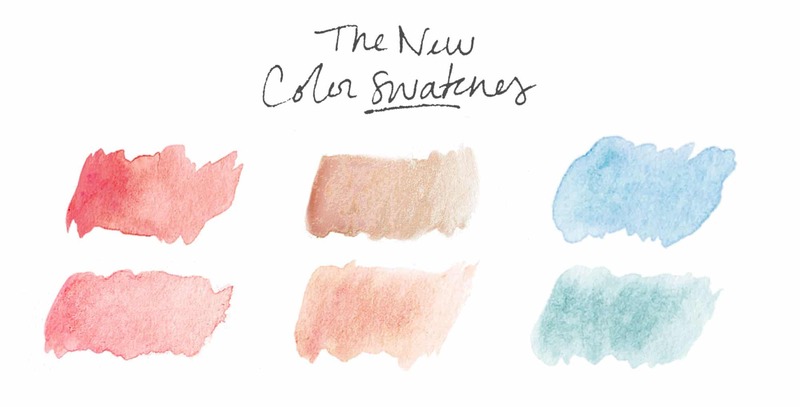 Use this process to fill up the rest of you pans by just building on the color. Don’t divide them into separate bowls, just build your color, pour, keep building! I pinky promise this is SO MUCH EASIER! After all of the cake pans are filled, pop them in the oven and wait! Once the cakes are cooled and before you pop them out of their pans, take a long serrated knife and cut the tops off. You can use the tops and turn them into cake pops! Once you have a smooth top, you can remove the cake from the pan and let it cool all the way. I made the mistake of making this type of layered cake without letting it cool, and let me just tell you that it was a total and complete disaster! OMG. DO NOT DO THAT. 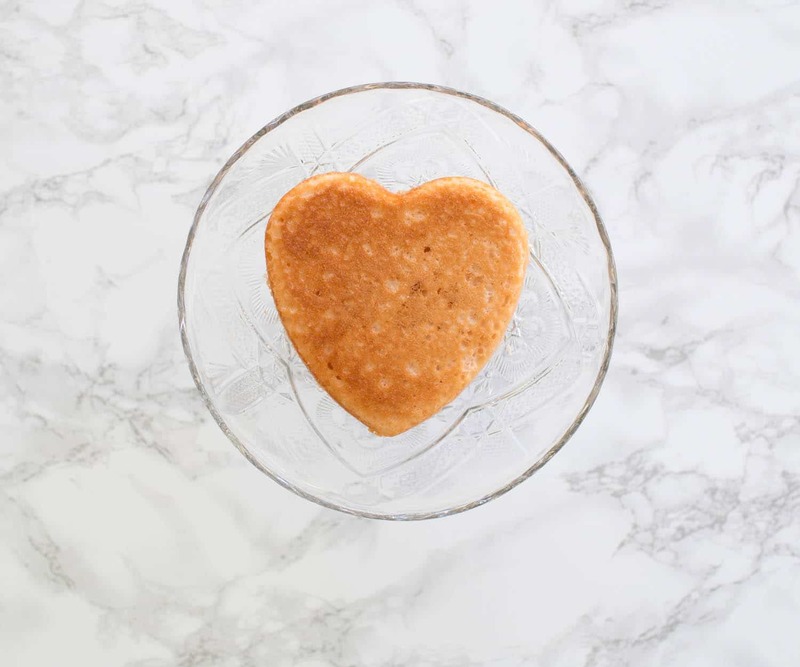 Make the cakes the night before, save yourself the tears. Do it for me. Now, we are onto the fun stuff: layering! Take your time on this, but layer each cake from light to dark. 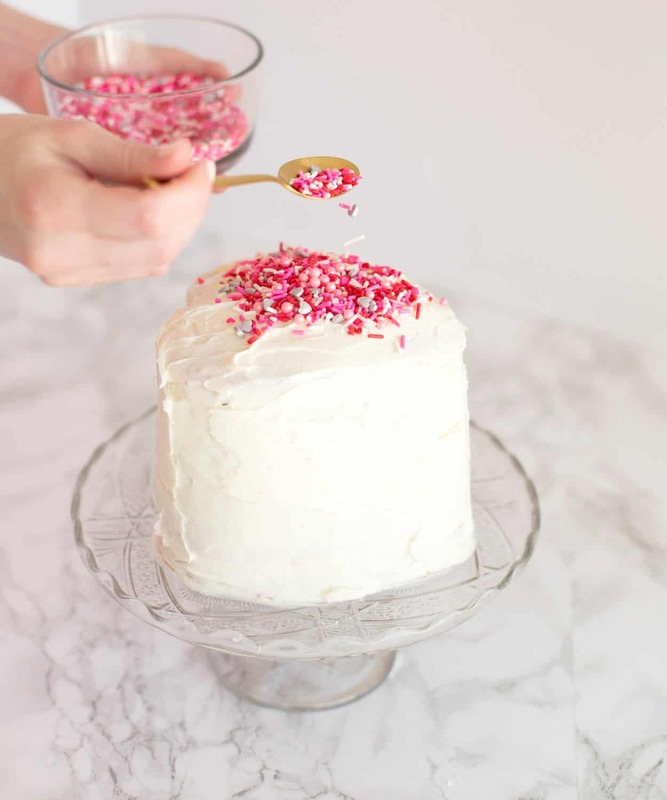 But first, put a little icing on the bottom of your cake stand, and then place your first layer on. Trust me, you don’t want this thing sliding all over the place when you get to layer 5! In between each layer, put a nice even level of icing and try to make the icing as level as possible. If the icing isn’t level, the cake will 100% lean! 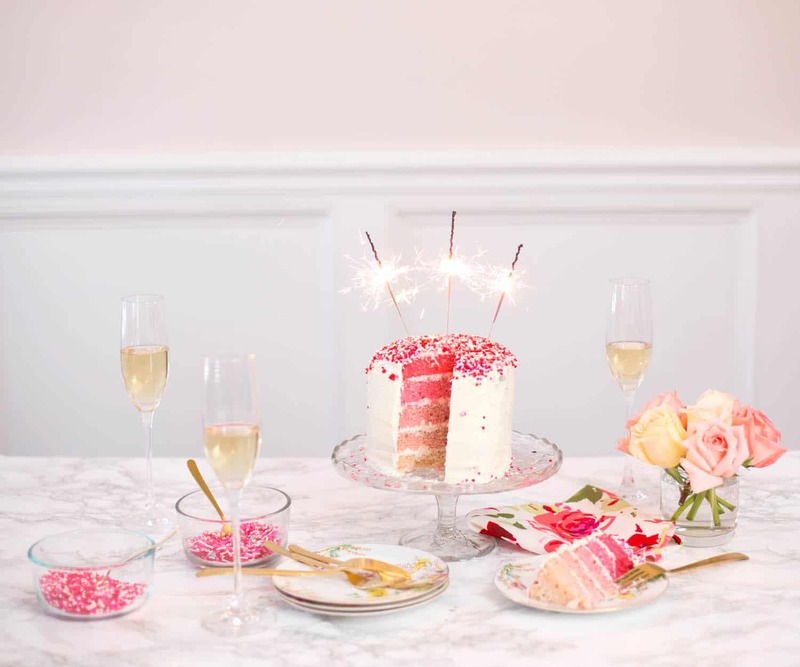 Add the sprinkles, and top the cake with sparklers because you are ready to go! 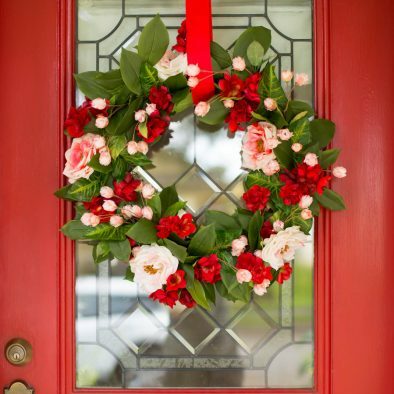 Your friends are going to think you are Martha Stewart, and I will agree with them! 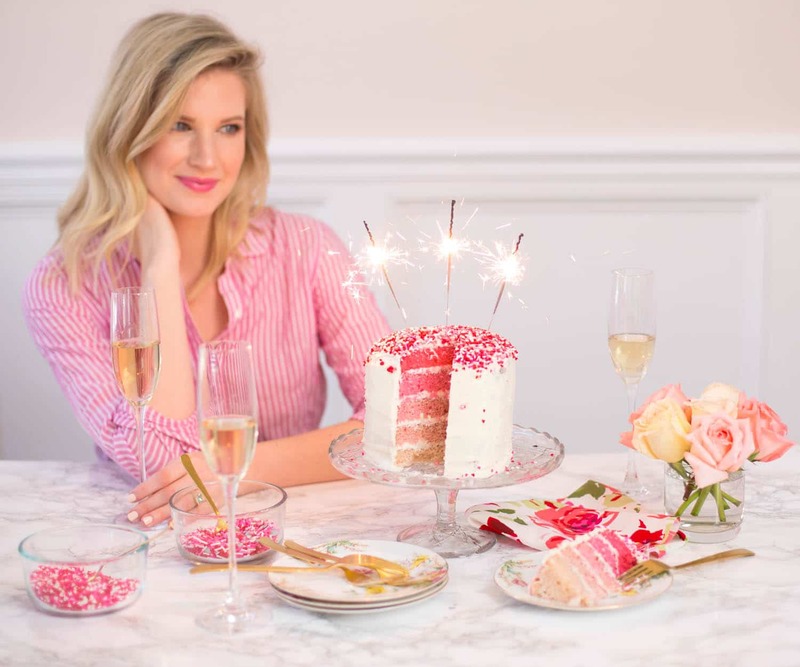 Just one more thing, you have to pinky promise if you make this cake to snap a photo and send it to me or tag me… I’m dying to see what you whip up! Good luck and happy baking, friends! Previous Post 15 Best Chick Flicks! 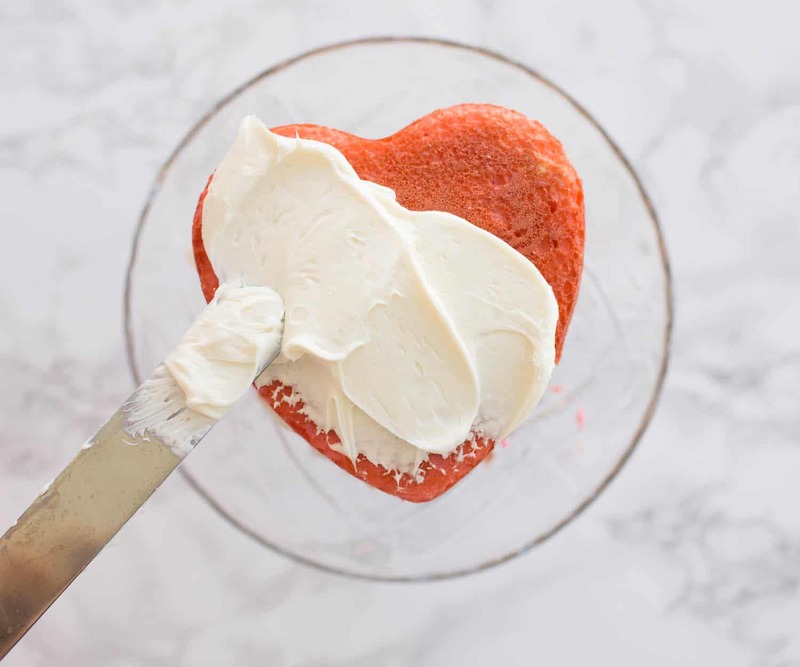 I love this Heart shape cake recipe. I read your article about this cake. 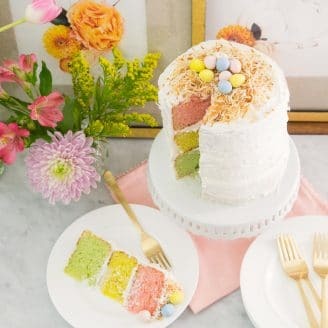 Thanks for sharing this great cake recipe.